It will inevitably happen to all of us. You’ll be well on your way to somewhere important when you feel an imbalance in your car. Your tire is flat. No big deal if you have a spare – and everyone has a spare… right? Not always. Especially not now, with so many manufacturers deciding to do away with spare tires as special features on their new models. Where Is My Spare Tire? Carmakers who are no longer adding spare tires to their vehicles are doing so to help preserve fuel economy, lowering the weight and ultimately help save on gas. Some manufacturers, like Kia and Toyota, will still provide consumers with an inflator kit, with a small air compressor and a can of sealant to use in case of a flat. You may also purchase a temporary spare tire kit from a dealer’s parts department for about $200 to $250. 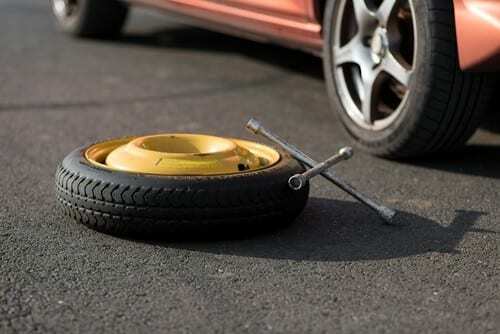 Others equip their cars with run flat tires, which can be driven for limited distances after a puncture. However, run flat tires are more expensive to replace, and often deliver a not-so-smooth ride. Please note that cars that still come standard with a spare tire will sport either a full- or half-size spare (also known as the donut spare). These are smaller than a vehicle’s standard tires, usually come with a speed limitation of roughly 50 MPH and over no more than 50 miles. It’s up to you to make sure you know how the car you’re buying is equipped. Don’t rely on the car salesman. Read the window sticker for details, and if you’ve purchased a new car without a spare tire, call your dealership and ask whether a temporary or full-sized spare-tire kit is available for your model. Whether you have a spare or a tire inflator kit, both should be periodically checked. Make sure the spares maintain the proper air pressure to ensure they will be ready to go should they be needed. All parts of inflator kits need to be in working order and function together. Tires are becoming more reliable, so flats aren’t as common as they used to be. An inflator kit helps only if you have a small puncture in the tread, not the sidewall. In these instances, you’ll have to call your local auto center. Changing a tire is simple enough, if you know the right steps to take. Secure the vehicle so it does not roll. If applicable, take off the wheel cover. Loosen the lug nuts. Don’t remove them completely. Jack up the vehicle to sit at least 6 inches off the ground. Position the spare on to the lug bolts. Replace the lug nuts and tighten them by hand. Replace the wheel cover and return to driving. More people will need to learn how to not only change a tire, but also operate the inflator tools. Colony One in Sugar Land is here to help you with all your tire questions and needs, contact us today!